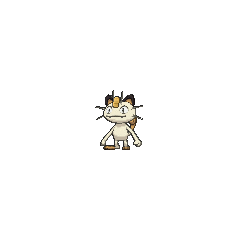 Meowth in game: 10,027 Who? Important notice! Pokemon Meowth is a fictional character of humans. In Alola, Meowth has a regional variant that is Dark-type. It evolves into Alolan Persian when leveled up with high friendship. Meowth is attracted to round and shiny objects, and has the unique ability to produce coins using Pay Day. It is known to wander about city streets and pick up anything that sparkles, including loose change. Upon finding a sparkling object, its eyes will glitter and the coin on its forehead will shine brightly. 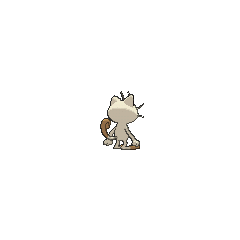 Meowth is a playful Pokémon with the capacity for human-like intelligence, with at least one member of the species teaching itself how to speak. Meowth tends to live in urban areas. Meowth was introduced to Alola as a gift to royalty. The luxurious royal lifestyle soon led to Meowth diverging from its origins and becoming the selfish and prideful Alolan Meowth. Alolan Meowth will turn hysterical if its coin or pride are besmirched. It also has great cunning. When the monarchy fell, the rare Alolan Meowth went feral and eventually grew as common in Alola as anywhere else. Alolan Meowth's fur is a light blue-gray color. Instead of brown markings, the tip of its tail, whiskers, digits, and the insides of its ears a whitish-gray shade. 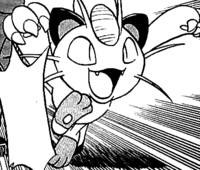 Alolan Meowth's whiskers maintain a slight curve compared to regular Meowth's straighter whiskers, and it has silvery eyes. 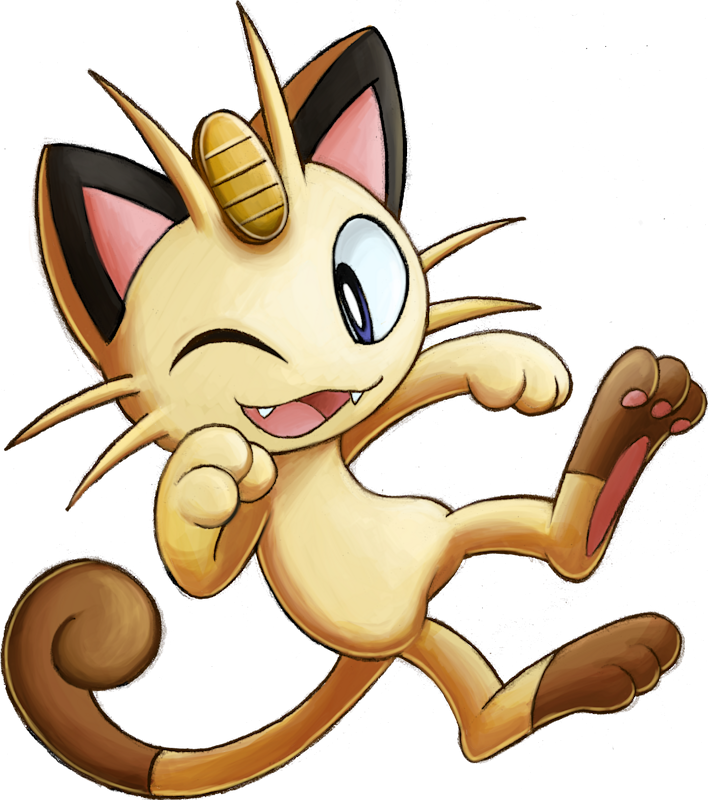 Meowth is one of the two main Pokémon in the series (the other being Pikachu). Meowth is a member of Team Rocket, and he is unlike ordinary Meowth in that he can speak human language and walk on two legs instead of four. His first appearance was in Pokémon Emergency!. Meowth was cloned in Mewtwo Strikes Back, but his clone couldn't talk or walk on two legs, just like an ordinary Meowth, likely due to the fact that its progenitor needed to learn how to do this. The Meowth clone is encountered again in Mewtwo Returns. Tyson's Meowth debuted in Like a Meowth to a Flame. This Meowth was dressed up like Puss in Boots, giving it the nickname "Meowth in Boots". In The Purr-fect Hero, Timmy was reunited with a Meowth that saved him from a Beedrill. A gang of Meowth on the streets of Hollywood, which Meowth was a part of and Meowzie currently is, appeared in Go West Young Meowth. A Meowth appeared in Lucario and the Mystery of Mew as a Transformation of Mew. A Giant Meowth appeared in The Island of Illusions!, but as one of Zoroark's illusions. AG109 Meowth Ash's Pokédex Meowth, the Scratch Cat Pokémon. Meowth loves to roam at night to gather coins and other objects that sparkle, but it spend most of the daylight hours sleeping. DP002 Meowth Dawn's Pokédex Meowth, the Scratch Cat Pokémon. It sleeps a lot during the day time and during the night-time it becomes active, moving around its territory. Meowth's first appearance is a cameo in Bulbasaur, Come Home! as one of the Pokémon that escapes from Professor Oak's Laboratory. In The Coming of Slowpoke (Eventually) when the Pokémon Fan Club President explains about the move Pay Day he also states that it is normally an attack specific for Meowth. It then appeared as one of Sham's Pokémon which attacked Green and Silver while they were escaping from Masked Man's compound (flashback at the start of the FireRed & LeafGreen chapter). Sham's Meowth would have evolved into one of her three Persian. Another Meowth appeared in The Last Battle XIII as one of the Pokémon sent to help the fight in Ilex Forest. In the Sun & Moon chapter, during a flashback three Alolan Meowth are shown in under the care of Sun's grandfather. In the present day, Sun is shown to have his own Alolan Meowth, nicknamed Dollar, using it to defeat two Team Skull Grunts with Pay Day. 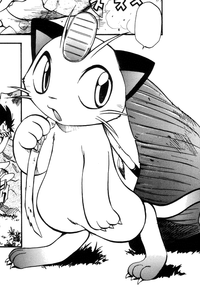 A Meowth also appears with a Persian in the book Sun had when he was younger. Meowth appears from a Poké Ball. It attacks opponents with Pay Day. This... is Meowth's dream. Meowth strides all over the globe, scattering invitations to other Pokémon insisting they come to "Meowth's Party." 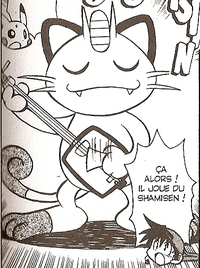 At this wonderful party, guests are packed in like sardines as Meowth climbs up the stage with its faithful guitar. It strikes a chord, pauses, and then rocks their world! Meowth returns as a Poké Ball Pokémon, attacking opponents with Pay Day. 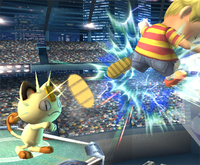 Meowth in Super Smash Bros. for 3DS. 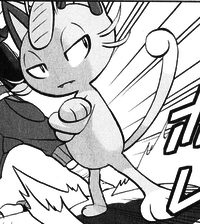 Meowth reappears as a Poké Ball Pokémon, unchanged from Brawl. NA: Meowth is a Normal-type, Scratch Cat Pokémon who absolutely loves anything shiny. It's a creature of the night, and it's not unusual to discover a Meowth and a Murkrow fighting over their finds. Meowth's attack Pay Day can deal a ton of damage if an opponent gets caught in it. How purrfect! PAL: Meowth, a Normal-type Pokémon, loves round, shiny things. It runs around at night, hunting for little treasures and trinkets, but often ends up getting into fights with Murkrow about who'll get to keep them. Watch out for Meowth's Pay Day attack. If it catches you from behind, it can be purralysingly pawerful! Frenzy Square: Guard the Fort! (Boss), Locomotive Cafe: Dash Race! The charm on Meowth's forehead bears a strong resemblance to an Amulet Coin. Meowth seems to be based upon the Japanese legend of the 招き猫 Maneki Neko, also known as the lucky cat or beckoning cat. According to one legend, a cat raised its paw to welcome a lord and saved his life when a lightning bolt hit the spot where he had been standing. Maneki Neko are often used as charms in restaurants and shops to bring customers or fortune and good luck. Statues of the cat are usually depicted holding a koban, an ancient coin used in Japan, like the one on Meowth's head. Its Japanese species name also suggests it is based on a Bakeneko. 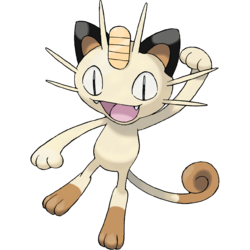 Meowth may be a combination of meow (the sound a cat makes) and mouth. The -th may also be borrowed from Nyarth, as both meow and nyā are onomatopoeia of a cat's cry.